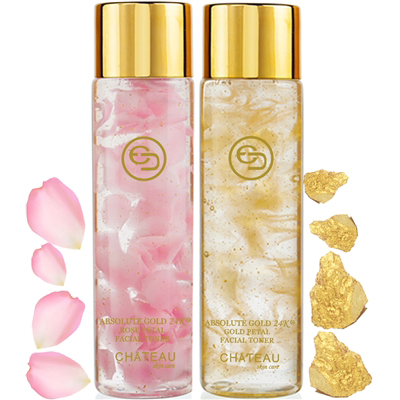 Absolute 24K Gold Petal Hydration Facial Toner. For all skin types. Replenish lost moisture with gentle toner that refreshes and promotes healthy looking skin, leaving skin feeling firmer and looking more vibrant. Infused with 24 Karat Gold, collagen, and potent antioxidants that nourish depleted skin making it more radiance and balanced. step 2: Uncover the second, smaller plastic cap that will appear after the first plastic cap was removed. Made in the USA.